Whether it's a glass smashing, a bell sounding or hearing what someone is cooking, the theme music of a WWE superstar can sometimes be as important, if not moreso, than what they do in the ring. It is the first thing an audience will experience and can sometimes be what they will also remember more. 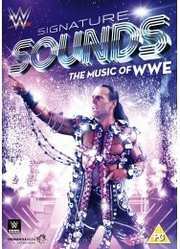 Signature Sounds: The Music of WWE is a look at some of the top twenty-five themes of WWE Superstars from the past and present. Jim Johnstone who composed most of the themes is interviewed throughout and also features interview with the WWE Superstars selected and bands like Saliva, Rev Theory, Breaking Point, P.O.D. Batista, Fandango, Sunny, PrimeTime Players, Goldust, Brodus Clay, Ultimate Warrior, Mankind, The Brood, Randy Orton, Dusty Rhodes, Shane McMahon, Rob Van Dam, Mr Perfect, Vince McMahon, Trish Stratus, Rey Mysterio, Stone Cold Steve Austin, The Rock, Shawn Michaels, The Undertaker, Triple H, John Cena, Chris Jericho and DX. The most obvious omission is of someone who WWE have now washed their hands off... brother... though at the time of making this documentary (which I am going to guess was 2011-2012) he was working for a rival company. Also missing are people like Bret Hart, Ted Dibiase, Ric Flair and Macho Man Randy Savage, though you can't have everyone in it. It is great to hear Johnstone play some of the songs acoustically, almost like an Unplugged Session. I do wish that WWE would commission him to do something like this as his simple piano version of The Undertaker's theme was fantastic. Also fascinating, was to hear how he made some of the themes sound the way they did like The Brood's and how The Rock's changed in ever so subtle ways over the years. Extra features includes a look at Stephen Regal (William Regal) Man's Man which is all kinds of awesome. There are also looks at Shawn Michaels' Tell Me A Lie 'Lost My Smile' song, Val Venis and Billy Gunn, Hakushi and Maria's themes. There is a great look at how Goldust's theme is created which is great, but could have easily been part of the main documentary. Finally, there is a look at Jim Johnstone's work scoring the WWE movie Legendary which he admits was done in a week and was pretty impressive and also went on to score more of the WWE movies such as Inside Out and Knucklehead. At less than an hour the lack of any other content is a little sad. This would have benefited from a feature that had all twenty-five featured as songs you could watch with their Titantron or slideshow to show how great the songs were in full. Songs like Dusty Rhodes' Common Man is such a great song it is sad we only hear a few seconds of it. It is also difficult to explain in less than two minutes why a song was so great and really that's all every selection was given (if they were lucky) and so some selections were brushed over hurriedly, when I'm sure there was more that could have been said about why certain themes worked and how Johnstone created them. Signature Sounds: The Music of WWE is a good set, just let down by the lack of content. With a few tweaks it could have been an epic masterpiece, instead of just a three minute pop fluff. However, if you are a fan of WWE music and want a sample of some of the best, this is a good disk to pick up.